Finding Dory is now out in theaters! Have you seen it yet?! My family and I couldn't wait for it to come out! We enjoyed watching it at the El Capitan Theater in Hollywood, CA. Before the release, we celebrated with a fun 'Just Keep Swimming' party! I'm excited to share all my Finding Dory party ideas with you. I often celebrate new movie releases - especially Disney movies! So when I learned of the Finding Dory movie coming out, I was ready to get the party started! The first thing I did was put together a backdrop for my main party table. I wanted to create an ocean setting to represent where Dory and her friends lived. To do this, I started with a roll of under the sea patterend paper. I added a couple blue wavy foil curtains over the top of the paper. Along the sides of the backdrop, I added a large seaweed cardboard standee and a coral standee. I used styrofoam letters to spell out Dory, and clear balloons were used to represent bubbles! Blue and orange paper lanters and a blue tablecloth helped tie it all together. On our dessert table, super cute Finding Dory treat cups held popcorn for our guests to munch on, and we all enjoyed drinking from our Plastic Fish Bowls that I used for cups. Yellow striped straws added a pop of color to the mix as well. Cupcakes, another must-have party food, were wrapped with personalized Ocean Friends cupcake wrappers with a quote from Dory herself on it. Super cute! I also created some fun personalized Ocean Friends stickers to go on the Beach Pail party favors. Our guests absolutley LOVED the fish crackers we gave out in DIY Ocean Friends Favor Bags. I personalized an Ocean Friends Banner to welcome all the guests to our 'Just Keep Swimming' Party! Out in the yard, I set up a Finding Dory water table for all the guests to play with. My most favorite part of any children's party is creating the "party table"! This is where I love to get crazy with table decor and party food! Hanging above the kid's party table I strung Yellow Tissue poms, orange and blue paper lanterns, and super cute Finding Dory Tissue Decorations. I covered that table with a Finding Dory Table Cover and added a Petal Fabric Table Runner over the top, making it look like a beautiful blue ocean. Our guests loved using all Finding Dory Party Supplies! They ate from Finding Dory luncheon plates, and sipped from Finding Dory cups, and even wiped their hands on fun Finding Dory Luncheon Napkins. I stuck some adroable Blue Wooden Cutlery inside of more plastic fish bowls for the kiddos. They loved the idea of taking home their very own fish bowl! I was able to find lots of matching party favors, from my local Target! They fit perfectly inside of Finding Dory Buckets. I had them sitting out on the table and used them as party of the party decor. I tool mini Finding Dory bubbles and placed them on top of mini white cake stands! 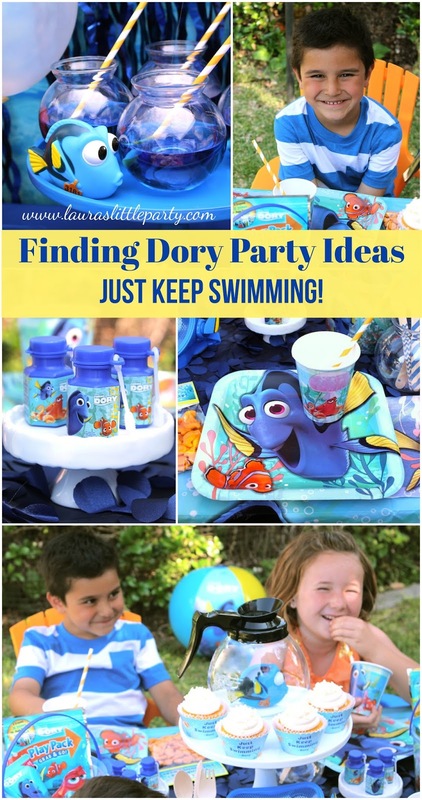 With all of these amazing products from Shindigz, you too can create your own Finding Dory party! Are you going to be seeing the movie this summer? Just keep swimming, and pin this for later! I am still in love with your Dory inside the coffee pot, but the fish bowl drinking glasses??? I can hardly stand the cuteness! Where did you find those awesome cake stands ? Do you love cake stands as much as I do?! Every stand you see in my party were purchased from HomeGoods. Thanks so much for stopping by!